From the mid-1800s, new mobility machines became available, and with them came new opportunities to cross borders and see new places in new ways. Railways were the most common means of "machine-based" tourism in the nineteenth century, but bicycles soon became a popular means of getting away to the country. Bicycles not only promoted self-propulsion across land, but also through gender barriers. Cycling became a symbol for new forms of women's independence. It became symbolic of the "new woman" in many countries, which was also seen in new forms of clothing (including trousers and "bloomers") and new forms of social behavior, and was hailed by women's advocates across Europe as a tool with which to liberate women. 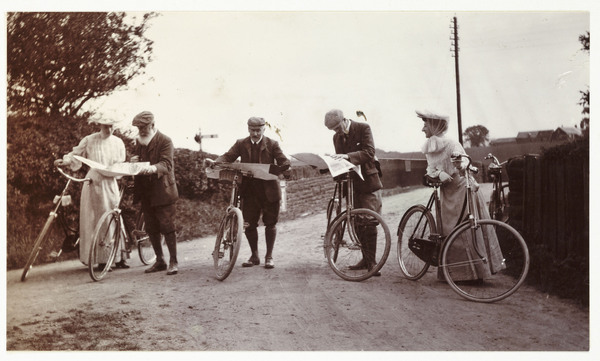 Apart from the visibility of cycling women cycling in cities and countryside, great cross-border adventures by women also began to appear around the turn of the century. These included American Elizabeth Pennell's Over the Alps on a Bicycle (1898) and the Latvian-born Annie "Londonderry" Kopchovsky, who cycled around the world in 1895. In the early 1900s, motorized adventurers became worldwide celebrities. Many of them were women. Increasingly independent women took bicycles, then cars and airplanes to explore remote parts of the world. While blazing these new trails, they also highlighted how Europeans viewed themselves in relation to the rest of the world.